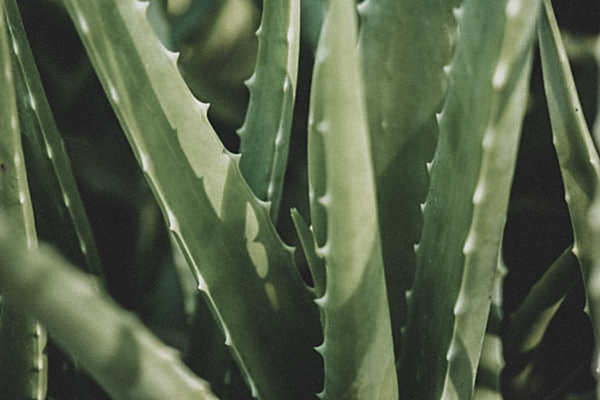 For hundreds of years the juice and oil from the aloe vera plant has been used to soothe skin, but recent research shows that these powerful ingredients are also great for oily skin, dry skin and more. Aloe vera is one of about 400 species of Aloes, which are all members of the Lily family (Lilaceae). It's believed to be native to the Mediterranean, but the exact native habitat is unknown. The plant has either no stems or very short stems, and grows to about 24–39 inches tall, with thick and fleshy green to grey-green leaves. Small white teeth line the margins of the leaves, and spiky yellow flowers grow in the summer. For best growth, it likes temperate climates, but is currently cultivated by humans all over the United States. Because it can survive in areas of low natural rainfall, it's often used in rockeries and other low-water gardens. Called a “succulent” plant because it can hold large quantities of water, it also has a clear, thick gel in the inner part of the leaf that's often used for minor cuts and burns. Traditional herbal medicine has incorporated Aloe vera for centuries. Ancient Greeks, Egyptians, and Romans described its use in their writings, with the earliest known record on a Sumerian tablet dating from 2100 B.C. Egyptian Queens associated its use with physical beauty, and both ancient Chinese and Indian populations are also reported to have valued the plant's nutritive properties. Internal use of aloe is reported to help with many wellness issues. According to the Mayo Clinic, some aloe components have shown in studies to help relieve constipation. One of the great things about this plant is its natural components. It has almost 20 amino acids; minerals like calcium, magnesium and sodium; enzymes; polysaccharides; and more—all helpful components in producing young looking, beautiful skin. It penetrates quickly and deeply, moisturizing at the lower levels of skin and nourishing with natural enzymes and amino acids. These properties also make aloe a great ally in reducing the visible effects of aging. Dry Skin: Aloe has long been used as a moisturizer, and recent studies suggest it may help reduce skin dryness. Because it's moisturizing but not greasy, it's perfect even for those with oily, combination, or sensitive skin. Soothing: Aloe is generally considered effective in promoting a cooling affect to the skin. If you find yourself outside all day, an aloe lotion — or the leaf itself — can help your skin feel refreshed. Oily Skin and Clogged Pores: Aloe is cleansing — and can help remove dirt and other impurities. It's great to use for oily skin and its natural “saponins” that help unclog pores. What do you think of aloe vera? Have you used it in your skin care regimen? Photo courtesy Tiny abellera via Flickr.com. Anahad O'Connor, “The Claim: Aloe Vera Gel Can Heal Burns,” The New York Times, September 8, 2008. http://www.nytimes.com/2008/09/09/health/09real.html. “Aloe,” University of Maryland Medical Center, December 31, 2010, http://www.umm.edu/altmed/articles/aloe-000221.htm. Aloe Vera plant provides many amazing benefits for skin. This is a best solution for many skin problems. I used it for my skin tags.